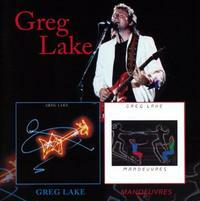 This is a new reissue of two older Greg Lake albums in one set. The second album includes a single bonus track, while the first has several. Don’t expect to hear ELP on this, as it is Greg Lake solo. That said, there are songs that definitely feel very much like ELP. There are a number of other musicians on these albums including Gary Moore and a big chunk of the classic Toto lineup. I’d say this set is well worth having. This powers in as very much a heavy metal tune. It’s a driving, soaring number. While it really is an anthemic metal tune, it’s also got a bit of an AOR prog sound. Another that’s quite AOR in style, this isn’t really metal at all. It’s more of a mainstream rocker. That said, if Keith Emerson were doing the keyboards here, this would probably sound a lot like the more rock and roll side of ELP. This is more of an AOR ballad than it is anything else. It works pretty well. It’s just not the best thing here. It does have some cool guitar work on it, though. I dig the retro keyboard sounds here. This is more of a straightahead rocker, too. It’s classy stuff and one of the more proggy things here. Yet, there is also a hint of 1960s rock and roll. Although overall this is another straight forward rocker, it has a drop back to the one of the proggiest movements here. That section is mellower and a bit trippy. It has hints of jazz. While this is another mainstream rocker, it wouldn’t be a big stretch to hear what this would sound like if ELP had done it. It would be a different arrangement, but the song would clearly work as one of their more mainstream rockers. This is definitely more of a 1980s styled hard rocker. It’s not a big change. Nor is it a standout cut. That said, it’s solid. Now, this is definitely a change. There is a lot of jazz built into this thing. It’s quirky. It’s also fun. It’s one of the proggiest things here, but not in the traditional sense of the word. Honestly, it’s one of my favorite tunes on the disc. It just works really well. The saxophone solo is a cool touch. More of a pure ballad, I like this, but it’s not as solid as the bulk of the music here. Now, this bombastic and proggy piece really feels like something Lake would have done with ELP. It’s one of the best tunes on this CD. It has some intriguing shifts and changes, too. This cover tune is an old school rock and roll screamer. It feels like something the Beatles would have done. There is definitely a lot of R&B built into this thing. It’s more of a straight ahead 1980s styled rocker. It’s fun, but absolutely not prog. This is more of a balladic piece. It’s evocative. It’s another tune that, with a different arrangement, would have been quite a home on an ELP disc. I like this one quite a bit. In fact, I would have probably put it in place of one of the other tunes on the album proper. A mainstream rocker, this has some definite prog leanings. It almost has a metal edge at times, too. This is definitely more of a pure prog thing. Sure, it’s still more on the AOR side, but you can’t argue with the prog angles to it. More or less a mainstream metallic rocker with a proggy edge to it, this is another classy cut. This is very much an R&B cut. It’s good, but not really my kind of thing. Here we get a mainstream hard rocker to continue things. It’s not a real standout, but it’s certainly capable. This is an AOR styled tune. It’s not anything great, but it works. Now, this power ballad styled piece is packed with emotion. It’s more in line with ELP type stuff in a lot of ways. It’s also more of a proggy piece of music. Here we get another intense balladic piece. This isn’t the proggiest thing here, in fact, it’s rather jazzy, but it’s quite strong. This is a ballad, but it’s incredibly powerful. I love this song so much. It’s one of the highlights. This is another mellower cut. It’s also another strong one. It’s one of the more ELP like pieces here. This is tasty cut, too. I think I would have opted to put this on the album proper in place of one of the weaker tracks. It’s more of a powered up ballad, but it’s effective.